All other Willys jeeps will have the adapter included in their tool sets at the factory. If your Willys jeep carries any of the above numbers, order your special, grease—gun adapter from the QM Motor Supply Depot, Fort Wayne, Detroit, Mich. Order by Willys part No. A—6l5l, Grease—Gun Adapter — Alemite 6517. 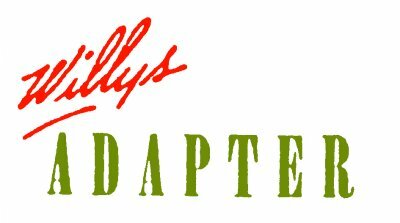 The adapters will be stocked at Fort Wayne in about two weeks. Wait until then before ordering. Incidentally, we hear that the same adapter on the Dodge 1/2 ton can be used on the Willys. It’s not the best practice, but in an emergency it will work. P.S. As you may have guessed, the Ford jeep will probably need one of these adapters. However, we haven’t heard from them yet — so you’ll just have to wait. From Army Motors, Vol 3, page 103. Editor’s Note: Click on the link above for the article concerning the Ford Adapter.